Brilliant display of rock & roll craftsmanship on legendary New Jersey garage rockers' third studio album, reminiscent of The Rolling Stones, The Yardbirds and The Kinks, but with The Doughboys own stompin' growlin' snarlin' sound! 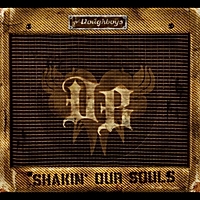 Just when you thought rock’n’roll had run its course…along come The Doughboys, with their third studio album – Shakin’ Our Souls. Chock full of hooks, riffs, powerhouse performances & The Doughboys’ own brand of infectious & immediately immortal rock’n’roll, The Doughboys raise the bar for what new rock music can & should achieve in the 21st century. The Doughboys first reunited in 2000 after a break of several decades, releasing a brilliant debut disc in ’07 (Is It Now? ), a spectacular sophomore effort in ’09 (Act Your Rage), a live performance/documentary DVD (Rock N’ Raw), no less, in ’11, & now – Shakin’ Our Souls! And you thought nobody out there was coming up with that nice warm analog sound anymore…The Doughboys (Mike Caruso, Gar Francis, Richie Heyman & Myke Scavone) offer up 14 brand new, all original tracks, showcasing their stellar songwriting chops & instrumental & vocal prowess, with guest appearances by such notables as Mark Lindsay (of Paul Revere & The Raiders, who also wrote the album’s liner notes) & Ten Wheel Drive’s Genya Ravan. Remember how records used to sound? Like the band was playing in your living room! Well, this new Doughboys album was recorded live to 2” analog tape at the House of Vibes in The Doughboys’ home state of New Jersey, produced by the band & Kurt Reil. Those nice wide tracks imbue the sound with warmth that only real, non-digitized sound waves can achieve, grooves that massage your eardrums, not assault them! The songs have one foot planted firmly in the garage music of the 60's & the other in the concerns & issues of the 21st century, just like The Doughboys, who got their start in 1963 but are firmly rooted & relevant in 2012. And they’re an amazing live band! In the meantime, The Doughboys take their live act all over the eastern seaboard, from Atlanta, Georgia to Portland, Maine, doing festivals like Musikfest & The Drive Invasion, opening for The Pretenders, The Yardbirds, Robin Trower, The Electric Prunes & many others, playing at the historic “Who Shot Rock’n’Roll?” exhibition at the Allentown Museum, appearing at prestigious venues like B.B. King’s, the Sellersville Theater, the Stone Pony & the Starland Ballroom. Theirs is a live show that pulls you in, envelops you in a vortex of pure rock’n’roll joy, & leaves you begging for more!